Empire of the Daleks; breakfast with the Doctors; more. New executive producer Matt Strevens speaks out; Michelle Gomez on Missy's life after death; more. Interviews with Jeff VanderMeer and Tananarive Due; Kate Wilhelm obituary and appreciations; industry news, reviews, and more. Interviews with Nick Harkaway and Ada Palmer; Hugo Awards ballot; industry news, reviews, and more. Elizabeth George; Hardy Boys; reviews; more. 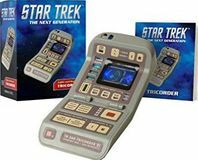 A light-up tricorder with sound, plus a 48-page booklet on the history of tricorders. There have been sad, harmless ghosts on the London Underground, whose presence does little more than boost tourism. But now frightening, aggressive ghosts are appearing on the Metropolitan Line, and they seem to be looking for something. PC Peter Grant and his BTP counterpart Jaget Kumar must brave the terrifying crush of London rush hour to figure out what's going on. The digging for a new spa at Storyton Hall turns up a collection of unusual bones and the ragged remnants of a very old book. The Rare Book Conference attendees are eager to assist Jane with this unexpected mystery - until a visitor meets an untimely end in the library. It's fiesta time in Broken Boot, Texas, featuring the First Annual Charity Chili Cook-off. When a cantankerous chili cook is found dead, Josie, her Chihuahua Lenny, and the steadfast Detective Lightfoot go looking for a killer. Includes recipes. Strange events at the shop force China to finally admit what Ruby has always known - their building is haunted. But by whom? Includes recipes. While helping her grandmother run the Biscuit Mountain Craft Center, Meg must track down a vandal and a killer. For half a century, Earth has been on the brink of total war with an implacable alien race. Biologist Anna Perez is the first to discover the truth - the hwarhath have segregated their society strictly along gender lines, to prevent the warlike males from harming women and children. In their eyes, humans are a dishonorable and barbaric race who may require extermination. On a trip to a small Pennsylvania town, Decker butts heads with a stonewalling local police force to investigate a pair of murders. An in-depth analysis of the tactics and equipment used in the Star Wars universe. Josette Dupre - the Corps' first female captain - must contend with a crew who doubt her expertise, a new airship that is an untested deathtrap, and the foppish Lord Bernat, who has been assigned to her ship to catalog her every moment of weakness and indecision. When the enemy makes an unprecedented move at the front lines, can she rally her crew and survive long enough to prove herself? Ages 9 and up. Literary game-maker Garrison Griswold is back in action, this time with an extravaganza on Alcatraz Island. But important items from the game are disappearing, and Emily's brother Matthew is being framed for it. As Emily and James follow the clues, they discover connections to a 19th-century tragedy. Logan West and John Quick are sent to Alaska, where a Russian black ops team may be working to steal US technology. When someone from Lily's past shows up, threatening her unless she returns something to him, Sailor steps in. When the man turns up dead, multiple witnesses ID Sailor as the perp, but he swears he's innocent, and Lily is determined to clear his name. When Halsey starts the digging for her tiny vineyard off Rose Avenue, the last thing she expects to unearth is an old woman's body. The Wine Club members pore over a list of suspects. Includes wine pairing tips. Linnet Ellery, a human attorney at a prestigious vampire law firm, has walked unscathed through deadly events. Now she and her vampire boss are leading a raid into Fairyland. As events unfold, Linnet will learn the source of her power - and that she is the most dangerous person in the world to her vampire and werewolf friends. When the local beaglers and their hounds unexpectedly discover a dead body, Harry picks up a trail of clues dating back to the post-Revolutionary War past. In the distant past, one of the gods fashioned a silver tiassa. To Devera the Wanderer, it's a pretty toy. To Vlad, it's a prop for a con he's running. To the Empire, it's a tool to use against the Jenoine. And to the Jhereg, it's a trap to kill Vlad. As it happens, however, the tiassa has its own agenda. When her tenant Dawson is suspected of murdering his ex-girlfriend, bookstore owner Sam Washington and her grandmother set out to solve the crime and blow the whistle on the real killer. In post-Katrina New Orleans, Jude is hiding from his magical ability to find lost things, his former divine employer, and a debt he owes to the Fortune god. When the Fortune god is murdered, Jude is drawn back into the world he tried to leave behind - a world of magic, monsters, and miracles.